You would be forgiven if you thought the picture below was a profile of one of the mountain stages of the Tour de France, but in fact it is a section through one of the walking routes on The Queen Charlotte Track. One of NZ's favourite past times is "tramping" thats hill walking to the rest of us, and we decided it would be a good way to experince the fab landscapes of the South Island. As it was our first time tramping, we decided to take a guided tour with a company called Wilderness Guides. There was only the two of us on the day we decided to go so we had our guide, Ryan Kelly, all to ourselves. (Needless to say there is Irish rellies in his family tree somewhere). Anyway the The Queen Charlotte Track is 71km long and can be broken down into approx 4/5 days tramping. Being novices and to a lesser extent, time constraints, we decided to do the first 14km leg from Ship Cove to Endeavour Inlet. Endeavour inlet being named after Captain James Cook's ship. It's not all hard work though, as you do stop along the way for some coffee and muffin's! Here's some more pics from the tops of some of the ridges. The day started off quite early and it was a little dull but I think what the pics lack in clarity they make up for in atmosphere. The vegetation changes along the way dramatically as can be seen in the contrasting scenary of the two following pics. There are many private houses and places to stay along the route the theory being that you can set off on day one and stay in hotels/ guest houses along the way until you reach the end of your four day 71km hike. 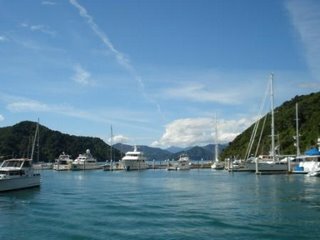 Alternatively you can hire a boat and get dropped off at one of the harbours and arrange to be picked up at the next stop. We had a great time on the track and now that we know we can do the 14km without too much difficulty we plan on doing a lot more tramping in the future. In case you didn't believe me here a pic of the muffins and the Cafe we stopped off in! 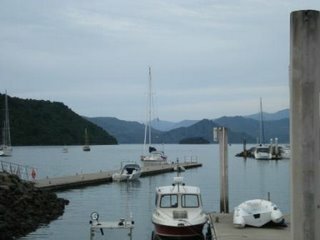 We also had a well earned beer at our last stop waiting for the boat to bring us back to Picton. Roughing it, it ain't! 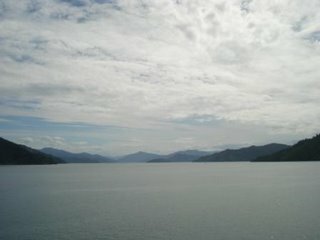 We had heard from numerous people who had been to NZ that the ferry trip from the North to the South Island was very beautiful especially the piece from the tip of the Queen Charlotte Sound to Picton at the far end. To give you an idea of how convoluted the sounds are there is one particular stretch which is 42 km long but has 379 km of shoreline! 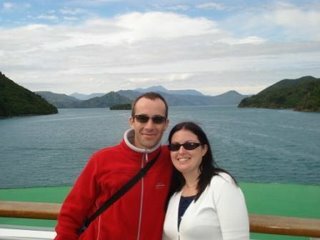 The following pic is a typical view from the ferry along the sounds and one of us on the bow of the boat. 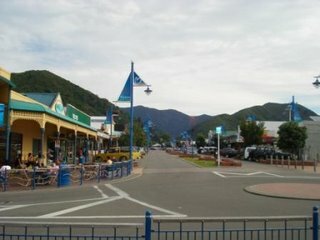 We had heard that Picton was not that nice a place and it only existed as a transport hub. To be fair the town itself is nothing special as the picture below shows. 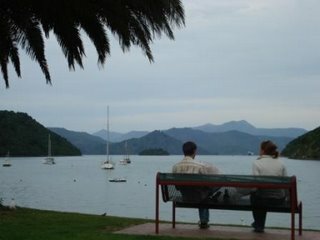 The views from Picton back up the sound make a stop over well worth while however. I reckon these next two pics are about the best I have taken on the trip so far. It was twilight when I took them so they are very atmospheric. I particularily like the one of of the young couple looking out onto the sound....the girl is actually looking towards the boy which is kind of suggestive! 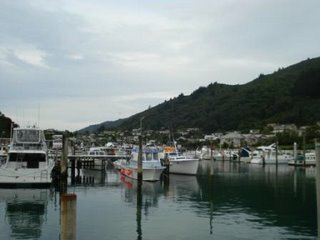 In Picton there is also a lovely marina and again just to give you an impression of how pretty it was here are a few more pics. The second one was taken on a different day when the quality of the light was much better. Finally the ferry is also used for transporting goods between both islands, whole trains drive onto the ferry and off at the other end. There was one passenger that seemed to summarise the whole Kiwi experience however as the pic below will show. Ahhhhh! There should be a picture here of a container full of sheep, but blogger has decided to act up again. You'll just have to use your imagination.